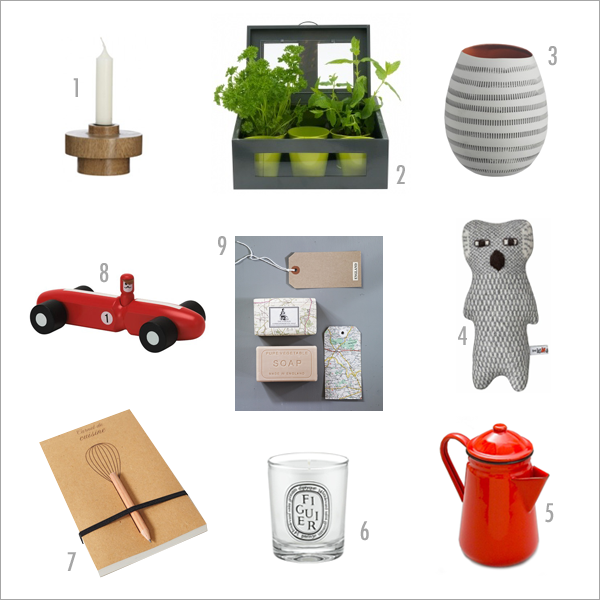 I was invited to be a guest editor over on Most Wanted, the lifestyle magazine from vouchercodes.co.uk this month, where along with Will from Bright Bazaar I've put together three Christmas gift guides. Here's a selection of some of the things I chose - all priced at under £30. Find out what else I picked here. 1. Wooden candlestick - Nordic Bliss £3.90 | 2. Mini greenhouse - Dutch by Design £29.95 | 3. Aspect vase - Habitat £28 | 4. Wilbur koala cushion by Donna Wilson - John Lewis £28 | 5. Enamel coffee pot by Falcon Enamelware - SCP £14.50 | 6. Diptyque mini candle - Space NK £20 | 7. Carnet de Cuisine (a recipe notepad for foodies) - Cachette EU10 | 8. Wooden racing car - The White Company £18 | 9. "The Foreign correspondents" soap - Cox and Cox £7.50.